Approach the village hall along Union Street (1st on the left as you enter Aberarth from Aberaeron, or 3rd on the right from Aberystwyth) as Water Street is very narrow. 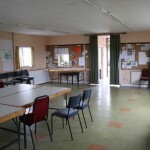 The hall is easily accessible for wheel chair users as there are no steps and large double doors. The toilets, whilst not fully accessible, can be used by wheelchair users and there is a handrail.